There aren’t many golf clubs in the UK that replicate the US private club model. At most British clubs, visitor play is welcomed as an additional source of income and a way to reduce the cost to members: this is in stark contrast to the classic US clubs, at which access is extremely difficult without an introduction from a member. In the last twenty years, though, a small number of clubs have been created that work on the American model and exclude green fee visitors and corporate days. The first and most successful of these in the UK was The Wisley which opened in the early nineties and was designed by renowned course architect, Robert Trent Jones Jnr. Located just across the river Wey from the Royal Horticultural Society’s Wisley Gardens, set in such a tranquil area of north - west Surrey, The Wisley is only a 30 minute drive from London's West End and was immediately ranked within the UK’s top 20 by Golf World when it opened in 1991. Twenty years on and The Wisley is clearly firmly established as one of the World’s leading exclusive private Member golf clubs, attracting captains of industry, sport and movie stars amongst its discerning membership. The Wisley is currently the home choice for fourteen tour professionals including some of the world’s leading golfers amongst its membership. Indeed, the club can boast an amazing statistic that ‘at least’ one of its Members has featured in every Ryder Cup since the Club opened and is testimony to its undoubted quality. The Wisley was the first Robert Trent Jones Jr.’ Course in the UK and has clearly been designed to challenge players of all abilities and features three loops of nine holes which combine to make three 18 hole courses each with a par of 72. 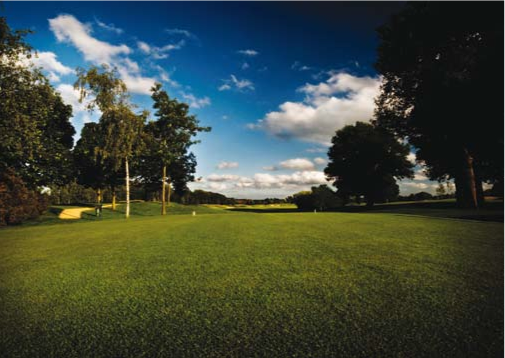 Water is an integral feature; the River Wey borders the undulating fairways and beautifully manicured greens while the lakes provide not only perfect reflection, but also extra challenge. The mark of a Trent Jones’ Course is the unique ability to combine love of nature and passion for the game of golf. The Wisley is a magnificent testament to his skill and creativity. The Wisley is wholly owned by its shareholder Members and despite its exclusivity, seems to have a real ‘club atmosphere’. A wealth of competitions, events and a varied and thriving social scene ranges from family Halloween and pancake nights to a Spanish restaurant night and during our visit preparations were underway for an Italian Ryder Cup night with one of its Members, Francesco Molinari. There appears to be an eclectic mix of nationalities, cultures and backgrounds that binds a common love of the game of golf, with an appreciation for the finest things in life. The clubhouse provides an ideal environment in which to relax. With influences from the work of Sir Edwin Lutyens, the clubhouse was designed by award-winning architect Charles Mador and the open-plan style and interior design creates a warm and inviting ambience with a comfortable contemporary edge. The dining experience at The Wisley is built upon a fine reputation for quality cuisine, freshly prepared by Head Chef Sam Peschier and his team, and fantastic hospitality. Whether it is a quick bite between nines, or a formal dinner with friends and family, you will be served in the renowned and warm Wisley style which its chief executive insists upon and his team follow with such enthusiasm. The Wisley is a true private members’ golf club with 700 shareholder Members, and shares are only available on the secondary market through a monthly auction. However, we were told that from time to time a limited number of shares become available for rental, usually in circumstances where the shareholder/member has to move abroad for a period of time. The availability of these shares is limited and may only be used by the renter for a maximum period of 2 years. We were sad to leave as The Wisley really does offer an environment and ambience of luxury, elegance and impeccable service. However, it manages to mix such exclusivity and quality with a relaxed atmosphere evidently enjoyed and appreciated by Members, their family, friends and anybody lucky enough to be their invited guests.